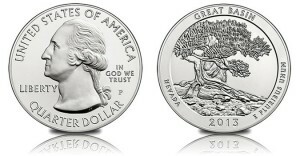 Sales of bullion America the Beautiful Five Ounce Silver Coins intended for investors have been quiet for a couple of weeks now but sales of uncirculated America the Beautiful Five Ounce Silver Coins for collectors have been rushing forward. 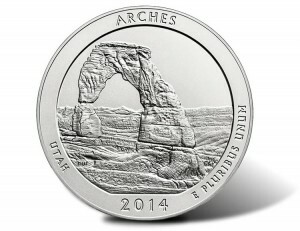 The popularity of collector America the Beautiful Five Ounce Silver Uncirculated Coins is on the rise with coins for this year outperforming those from last year. 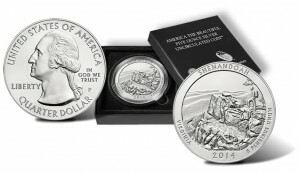 2013 White Mountain National Forest Five Ounce Silver Coins are no longer available from the United States Mint, the bullion version produced for investors and the uncirculated version struck for collectors. 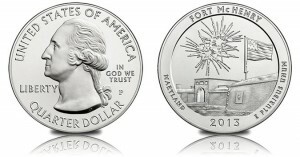 Debut sales figures were released today for the new Fort McHenry National Monument and Historic Shrine Five Ounce Silver Uncirculated Coin for collectors. 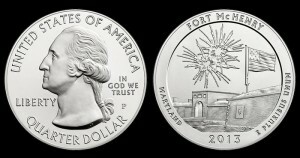 Next week marks the debut of several United States Mint America the Beautiful products with quarters and five ounce silver coins emblematic of Fort McHenry National Monument and Historic Shrine in Maryland. 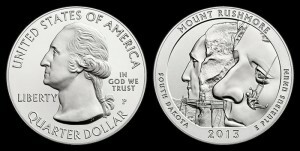 So far this year, three of the five designs of America the Beautiful Five Ounce Silver Coins for 2013 have been released by the United States Mint. 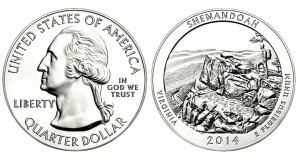 Debut sales figures are available for newly released Perry’s Victory and International Peace Memorial Five Ounce Silver Coins.